In the previous two days, after having discussed their identity, mission, core values, and crises, the sixteen members of Upgrade! gathered this morning with several issues on their agenda, which have not yet been touched upon this week at Winter Camp: collaborative tools and managing collaborative tools, lists and managing lists, and the decision making process. The discussion about potential models of network organization was combined with discussing the upcoming event organized with the assistance of Upgrade! International in Sao Paolo. Upgrade! defines itself as a decentralized, non-hierarchical network of currently thirty local nodes, which started in 1999 in New York City. It seems to me rather that the network has a distributed structure, considering that all the locally defined nodes are equal and autonomous. The network structure fundamentally defines the decision making process. While the network maintained a quite democratic mode of organization and decision making so far, this model has its weaknesses as well. Not all the members felt motivated to contribute in the decision making process by voting at the right time. A potential solution that has been discussed during the group meeting today was voting versus mandate, or a combination of the two, according to the various circumstances. In situations which require higher effectiveness over a short period of time, the democratic procedure would be ‘sacrificed’ in order to meet deadlines and objectives, and the decision power would be delegated to a smaller representative group. As a matter a fact, working in smaller groups has proven to be an effective method to reach results also during work at Winter Camp. A vulnerable point with which the network seems to be confronting at this moment is the decision making process, reason for which changing the currently used collaborative tools: mailing list, wiki, website, has been considered. There seemed to be an oscillation between working in a democratic manner, and giving people clear responsibilities and mandates to work on. An important value for a distributed network like Upgrade! is transparency. Introducing a wiki as communication platform is a way to achieve transparency and avoid isolation of the local nodes. The growing number of group members might also turn into a vulnerability of the network unless the mode of organization is adapted. An important point of discussion of Upgrade! at Winter Camp was precisely how the growth of the network should be approached and how membership should be defined. Since the network does not impose constraints of activity on its nodes, each of the nodes has the freedom to be active or passive. The nodes may be inactive until an activity of local interest determines the engagement of the node and consequently the network’s support. The weakness of this approach is that it is difficult to distinguish between temporarily idle nodes and ‘retired’ nodes, therefore it is difficult for the network to have an account of who it can count on. The local nodes are connected in an online global network that meets twice a year. The question arose of how to activate the nodes and make them more efficient without imposing constraints on them. The network does not seem to have a set of predefined norms to regulate the interaction between nodes. The conditions of participation in local events are established ad hoc and depend on the circumstances of each event and the needs of the local host, as it had been evident from the discussion regarding the organization of their upcoming event in Sao Paolo. The group also noticed a difference of involvement between generations of nodes. The old nodes seemed to be more involved and dedicated than the new ones. This situation may be connected with the fact that an important value on which the foundation of the network was based, and which guided their relations was friendship. Now that the network is growing and more nodes are being attached, the strategy of accepting new members might change from friendship to more formal criteria. 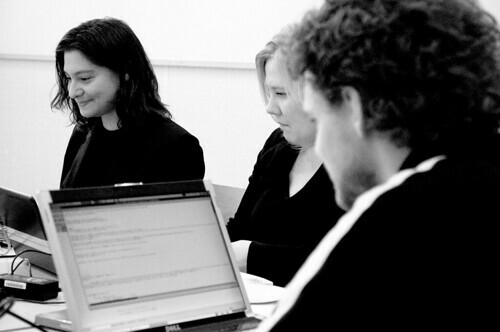 According to their website the Genderchangers network initiated in 1999 and was inspired by the ASCII hacklab in Amsterdam. Genderchangers defines itself as a network for women, technology and freedom of information. They initially started with knowledge-sharing courses for women by women and because of the enthusiastic response to these initial workshops and courses the Genderchangers started to organize an annual international event, the Eclectic Tech Carnival in 2002. The group has gathered at Winter Camp 2009 with a series of practical objectives in mind: writing a manifesto, coming up with a slogan and a list of requirements for improving the Genderchangers website. While discussing the potential futures of the network, several issues concerning past and present challenges of the group came up. 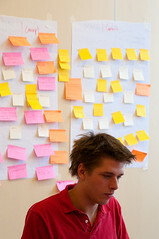 The network encountered several challenges during their activity. 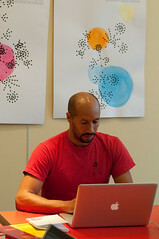 A feeling of disconnection in-between workshops and other events where they usually meet has sometimes been experienced, which is why the group values face-to-face meetings in order to stay connected. Workshops are a great opportunity for group members to come together, although their number is currently limited by a shortage of resources, such as the fact that they do not have a space of their own. The group started as a hands-on group so physical meetings are crucial for this type of activity. The session opened up questions about potential directions that the network may take in the future. In assessing the current situation and thinking about the future, there are certain values that the network wants to preserve, and which are encapsulated in the theme: “women, technology and freedom”. Genderchangers also wants to make a point about working with free and open source software, a value which they want to preserve. The network’s target group was also an important point of discussion at Winter Camp. The group envisions its role as opening doors to women’s curiosity about technological issues, creating a space where women do not feel intimidated to work with technology, and offering knowledge for women who are interested in technology. The network wishes to be a catalyst and stir the interest of women in understanding how technology functions. The group also discussed as a potential goal expanding their female audience beyond the culturally initiated. In discussing the future development of the network, the group seems to be facing a tension between maintaining their status quo and continuing to enjoy what they currently do, and expanding their activity. The first work session of Genderchangers at Winter Camp was successful in opening up points for further discussion, regarding the identity of the group primarily, and potential audiences secondarily. the act of taking a task traditionally performed by an employee or contractor, and outsourcing it to an undefined, generally large group of people or community in the form of an open call. Their website, currently a semantic wiki, brings together not-for-profit projects and volunteers, with the purpose of creating a community that can mutually support each other. The group of volunteers themselves all physically came together for the first time at Winter Camp, with a busy and well structured agenda of discussion. Several issues were prominent, such as: social infrastructure, models of organization and leadership, inter-organizational collaboration, and technical infrastructure. Since Microvolunteerism works with individuals in an extra-monetary economy, the issue of what resources and compensation Microvolunteerism can generate for volunteers has come up. A more important challenge than attracting volunteers for the network is maintaining their interest to participate in “microprojects.” The issue of maintaining volunteer involvement has been related to several other issues, ranging from defining a clear organizational identity, to ways of motivating volunteers by making their benefits clear, finding a way to offer feedback for their interventions, or maintaining the possibility for volunteers to make suggestions at any level. The group also admitted social recognition to be a huge factor of reward worth taking into account. The choice of projects is also considered to be an important issue motivated by recognition. One point of discussion here was to choose those projects that take place in a context which makes successful interventions possible. Although the organization currently supports any type of projects, the possibility of creating a pattern in the choice of projects, finding a niche for projects has also been touched upon. Another important issue on the group’s agenda this afternoon at Winter Camp has been models of organization and leadership, in terms of opportunities and limits of each model. There has been an oscillation between a well defined and documented organizational identity, which would support advocacy goals of the network and would facilitate inter-organizational relations, and a lower profiling strategy, which would permit the network to maintain flexibility of choices. In terms of governance, two options have been discussed: centralized, hierarchical, and ad-hoc leadership. The discussion focused around opportunities and challenges of each model. While individuals and organizations take more notice of a stable organization, and a stable organization can facilitate relations with governments because of its well-defined identity, they concluded by opting for a more flexible structure, which combines ad-hoc and centralized management, core and periphery, according to the context of the project. Regarding the issue of “institutionalization” of networks, one of the member’s stand was that institutionalization is inevitable for any group which establishes goals and means to achieve them. In relation to leadership models, a particular concern was their effect on creativity, and how to maintain creativity in hierarchically managed projects. Another important issue for discussion was collaboration with other non-governmental organizations. The group considers that there is a deficit of collaboration between NGOs, and envisions networking with other organizations to be an important objective on their future agenda, by means of informal events to start with. The technical infrastructure is one of Microvolunteerism’s main points of discussion during Winter Camp. Their current platform is a semantic wiki, which the network plans to replace in order to accommodate their evolving objectives, as, for example, to enable a type of sharing of volunteers between several projects by providing a resource, a tool for people who need volunteers. 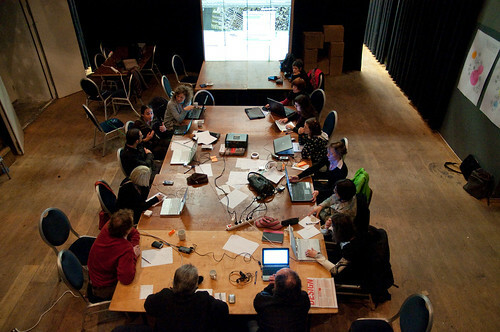 One of the options discussed for technical upgrade was the a platform currently developed by Mediamatic, AnyMeta/ Open-CI. production – a series of short advocacy films and a feature documentary. A sensitive issue in this project according to Michael, is reconciling the need to protect sources and work covertly with the desire to make an open collaborative space and a high visibility platform. Overall, this afternoon session seemed a productive one for Microvolunteerism, a group which started work at Wintercamp with great enthusiasm, also determined by the fact that this is the first time where the entire network is physically present in the same location.